My work grapples with systemic oppression across multiple axes. My scholarship is broadly situated within student success discourse as I seek to understand how historically underrepresented groups experience predominantly white institutions. 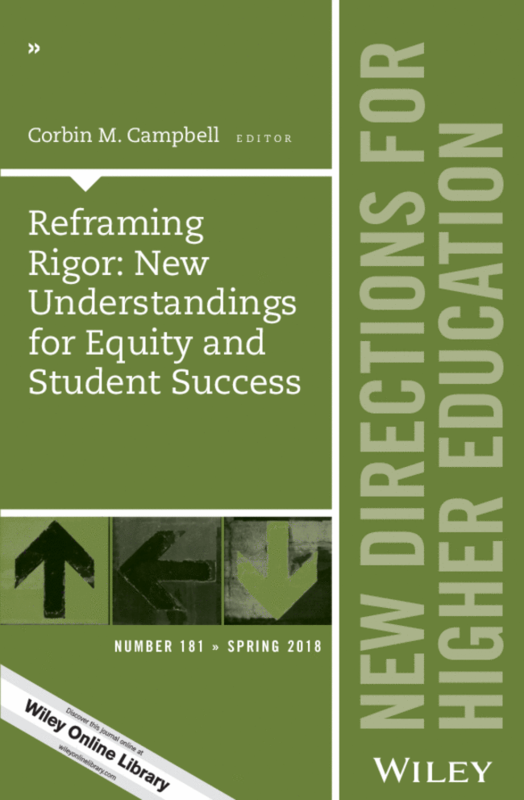 Abstract: This chapter describes the limitations of the traditional notions of academic rigor in higher education, and brings forth a new form of rigor that has the potential to support student success and equity. What is “hard” about college? The concept of academic rigor has been remarkably narrowly defined in contemporary higher education. Rigor is often equated with hard work in terms of the number of hours students spend studying or the quantity of assignments—or “piling on” a lot of work for students (Arum & Roksa, 2011). Alternatively, as derived from the recent K–12 standards movement in the No Child Left Behind act, rigor may be seen as an advanced level of curriculum (achieving mastery of prespecified content; for example, less rigorous algebra versus more rigorous calculus) (Matusevich, O'Connor, & Hargett, 2009). Yet, if we ask students what was “hard” about college academics—many other understandings may emerge—perhaps what was “hard” was maintaining one's identity while learning material that does not align with one's cultural values. Perhaps what was “challenging” was shifting basic assumptions that have been a core part of an individual’s experiences. Abstract: This study used a phenomenological approach to analyze the self-efficacy of two African-American women obtaining doctorate degrees at one predominantly white institution in the Midwest United States. Findings from this study suggested that verbal persuasion and vicarious experiences were the strongest predictors of self-efficacy as the two students attributed their success to supportive peers, family, faculty and engaging in welcoming communities. Student challenges to success included feelings of isolation while developing an academic trajectory, compounded by uninvolved or ambivalent faculty, difficult dissertation committee dynamics, and not asking for help. Self-efficacy provided a useful framework to help understand these experiences and the multiple variables impacting academic success in the context of doctoral studies for African American women graduate students in these types of institutions. Abstract: The purpose of this study was to examine Black female college athletes’ perception of power within the context of a “safe cultural space”. Scholars note the ability to discern the notion of power and its dynamics is a key factor towards empowerment. For marginalized populations, addressing topics such as power is best within a safe cultural space, or an environment that is free from surveillance and allows students to freely express themselves (Collins, P. (2000). Black feminist thought: Knowledge, consciousness, and the politics of empowerment (2nd ed.). New York, NY: Routledge.). Employing Black feminist thought, eleven (N = 11) Black female collegiate athletes that participated in a culturally relevant program within a historically White institution of higher education were examined utilizing qualitative methods. Findings revealed the women's understanding of power was as a possessive attribute; and, the words and symbols they attributed to power reflected hegemonic examples of power. Hegemonic ideologies pervade college athletics, thus, the creation of “safe cultural spaces” allowed the Black female college athletes to acknowledge their marginalization amongst peers and discern how power dynamics affects their development in sport and society. Abstract: Because little work exists on the sense of belonging focusing on just Black undergraduate women in science, technology, engineering, and math (STEM), especially at highly selective predominantly white institutions (PWIs), this study takes a phenomenological approach to understand the lived experiences of Black undergraduate women in STEM by exploring how racial and gendered microaggressions influence how three African American women majoring in the sciences experience sense of belonging at PWIs. A phenomenological inductive analysis was used to compile the research findings, which indicated that racial and gender discrimination, isolation, marginalization, and alienation resulting from microaggressions occurred. Implications for inclusive practices are discussed. Abstract: This study reconsiders academic rigor by using a new conceptual framework that focuses on rigorous course practices and by using quantitative observational methods at two selective research institutions. Findings suggest that rigor can be cultivated by classroom environments and educational practices, such as active learning and cognitively responsive teaching.